What Did You think of the Penn & Teller 'BS' TV series (show)? Discussion in 'The Pub' started by Lucidology, May 5, 2016. I'm 50/50 on the show.. Its early and I didn't get much sleep so I'll comment but may regret it later. I haven't watched in several years but I believe I saw most of the episodes, and hopefully I'm remembering them correctly. I think the show is entertaining, but I can't see it for much more than that. The premise is to debunk things held (mostly) in high regard. I like this, in general. People should think, not be told what to think, but that's another thread. What I'm not always keen on, is the embarrassment and singling out of an individual for something they believe in. As humans, we are flawed. Some of us do better than others, but a charismatic individual will find followers of a belief in any realm (see the show...). Human nature can be blamed for darn near everything, but I don't usually rally behind patronizing someone for something they're committed to. For better, or worse. Its a free country, and as long as people aren't hurting others, live and let live. Education isn't a spoon fed system, its objective assimilation of information from as many reputable sources as possible to draw a conclusion. What "BS" did well, was present multiple arguments. That aspect of the show I thoroughly enjoyed. Even if I didn't agree with their conclusion or stance. bloomz, 65DuoSonic, Lucidology and 1 other person like this. I remember Penn and Teller from years ago but I don't remember that specific series. They sound like they are doing something like Ali G would do from your descriptions. I liked it a lot at first, I really loved the skewering of the pompous "true believers" in whatever they were on about that week. I went back and watched a few not too long ago - it's not great for watching a few in a row. My fav (that I can recall) was the Feng Shui episode. The waxing episode was pretty funny too. Never watched their stuff except for a couple episode of their "Prove Us Wrong" show or whatever the name was. There were some really good magic tricks and illusions in that show. A few years ago I got to sit front row for Penn & Teller's show at the Rio in Las Vegas. Before the show, Penn Gillette was playing jazz on an upright bass with a "Tattoo man" on piano. They were both very good musicians. The early arrivals were welcomed to come up and hang around the piano while they played and then we all were part of a skit later in the show. Penn talked about the history of magicians and some of the more fun practical jokes they have played on celebrities and friends over the years. Someone asked Penn about Teller being a science teacher, he said "Folks, I have been with Teller for many years now and I personally believe him to be one of the most intelligent people on the planet." Sitting front row and having Teller do slight of hand magic 3 ft away from you is just amazing. He may be the best slight of hand in the world and during his presentation he shows you how he does it, but then watching him do it, even after you know how it is done, unbelievable how good he is. They did the Constitution and US Flag skit, very patriotic and make you glad we have the US Constitution and our freedom of speech. Watched them shoot each other and catch the bullets in polycarbonate cups in their mouths with squib loads in 357 Mag Colt Pythons, well executed trick. They had fun bashing Chris Angel's current trick at the MGM, pretty much told everything about how he pulls it off. They had a bunch of fun at the expense of well known celebrities. And after the show they had a very friendly meet & greet, amazing guys. What I enjoyed most was their use of science and physics in much of their act. Highly recommend spending the extra bucks for the up front seats if you attend their Vegas act. Orm-D, Killed_by_Death, bloomz and 2 others like this. Great premise, but a bit too smug at times. Birdsmoke, cogan, rhinocaster and 3 others like this. This was my reaction to it, and Penn generally. As a huge P&T fan I liked the show and stand behind what they are promoting but didn't watch all episodes. They have been long time promoters of skepticism and critical thinking. I recently heard Penn talking about that show and the reason they went about it the way they did. Penn's argument is that promoters of woo and pseudoscience tend to be very passionate and convincing when pushing their beliefs. On the other hand those that speak out against it often don't use that same passion and conviction. His idea was to use that same passion and conviction and push back with as much or more effort. dlguitar64 and Lucidology like this. Agreed. I really enjoyed the attitude (even the smugness), but I was not wholly comfortable with where they went on a couple pretty political issues. Should we debunk things like astrology and ghost hunting? Yeah, that probably a "target-rich environment." Do we really need to debunk things like recycling? For example, pointing out the gaps between what recycling promises and the form it actually takes is always useful - dismissing it as wasteful (ironic) appears to me to be wrong-headed. cogan and bloomz like this. Depends on the subject. While I like them generally (as magicians & comics - Penn BTW is a very good bass player), and they do offer some reason and logic for why they think something is BS, I tend to find their approach to be in the standard "you're an idiot if you believe this stuff" (shaming or bullying) mode. I generally enjoyed the show, but I agree that Penn can be off-putting. I love P&T, even Penn's smugness on BS, a show that I loved. They're both impressively intelligent people, staunch libertarians which is one of the things I like about them. They also mingle with the audience after their shows which is very cool. I actually had a nice conversation with Teller. I sat in the front row and saw them on Broadway. 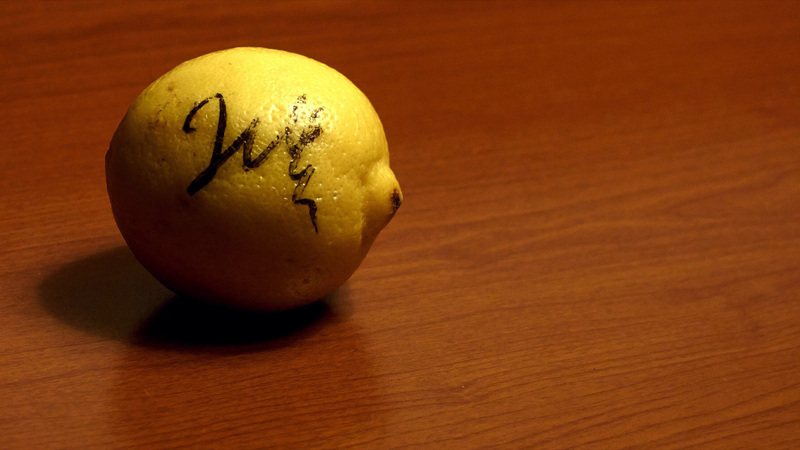 Teller even signed my lemon. I liked it. Yeah, Penn was smug. Highlights for me were the handicapped parking episode and the dolphin episode. Penn said in a recent interview they would like to go back and visit the things they got wrong on BS. Teller even signed my lemon. Did he also squeeze it for you?